On April 22, 2000 (or April 23, according to some sources), B1G* softball power Michigan suffered a five-inning run-rule loss to Northwestern by a score of 12-0. For those not familiar with the term, under a run rule (also known as a mercy rule), a baseball or softball game will be called off early if one team has built a large enough lead after a specified number of innings. In NCAA softball, where the regulation length of games is seven innings, the run rule will be triggered when one team leads by at least eight runs after five or six innings. From 2000-2013, Michigan's softball program won 10 regular-season B1G titles (nine outright and one tie), made the Women's College World Series six times, and captured the NCAA national championship in 2005 (see UM's softball record book). Entering Friday night's game at Illinois, the Wolverines had played 270 B1G regular-season conference games (i.e., excluding the conference tourney) since being run-ruled by Northwestern in 2000. In fact, Michigan had lost only 41 conference games during that time, an average of roughly three per season. With Michigan coming into last night's game with a 15-2 conference record, compared to Illinois's 3-14, the occasion would not have seemed ripe for the Wolverines to be run-ruled in a B1G contest for the first time in 14 years and 270 games! As a proud University of Michigan graduate, it pains me to say it, but it happened. The Wolverines were indeed run-ruled by the Illini, 10-2 in 6 innings. Credit Illinois with timely hitting in bunches. As the linked game article notes, "Four two-out hits in the bottom of the fourth led to Illinois' three runs. Three doubles in the sixth led to the run-rule decision." Four Michigan errors didn't help either. *This is the wordmark for the Big Ten Conference. If one reads the "1" like an "I," it says BIG. Also, the "1G" is supposed to be read as a 10. Cross-posted at my College Softball Blog. Less than an hour from now, the San Antonio Spurs will put their 19-game winning streak on the line in Oklahoma City against the Thunder. Last week, as the Philadelphia 76ers were plummeting toward a tie for the NBA's longest losing streak in history (26 games), I posted an analysis of whether teams were ever able to end long losing streaks against really good opponents. Occasionally this happened, as we discovered. More likely, however, was that a skid would end against very weak opposition. With tonight's Spurs-Thunder game starting shortly, I have put together a graphic that turns last week's question on its head. How often does a long winning streak end against poor opposition? Or, does it nearly always take a high-caliber opponent to end a team's long winning streak? Except for now looking at all-time great NBA winning streaks instead of losing streaks, my methodology today is the same as last week's. 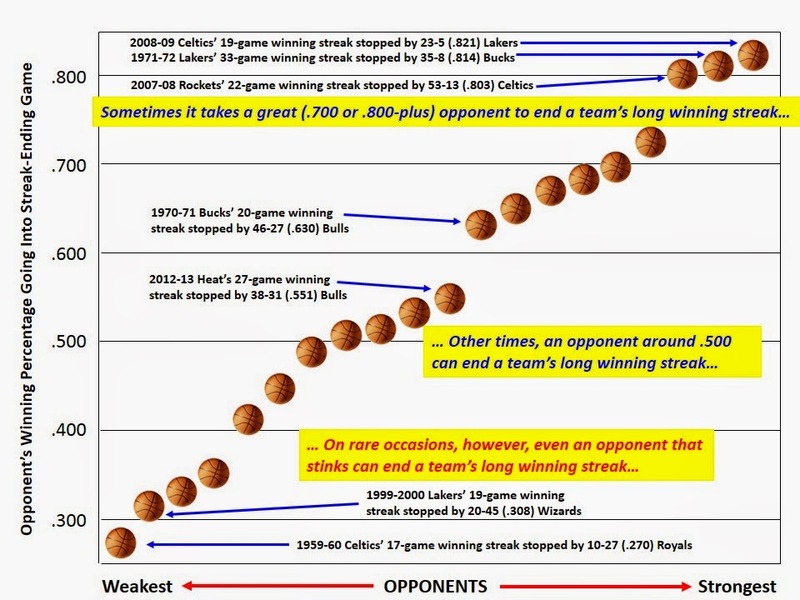 What we find in the graph below (on which you can click to enlarge) is that some of the greatest winning streaks, such as the Lakers' record 33-gamer, were ended only when a stellar opponent came up on the schedule. A few times, however, a hot team was embarrassed by an opponent playing at or below a .300 clip! UPDATE: The Spurs' winning streak ended at 19, with a loss to the Thunder.